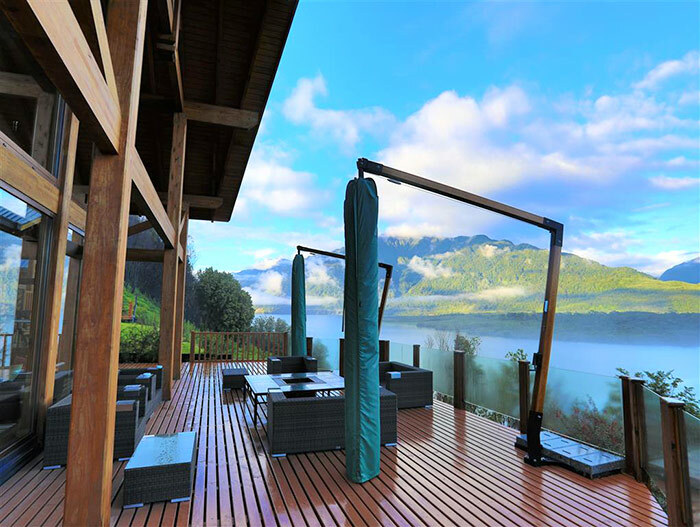 Chimalfe Patagonia Lodge takes three hard years to be open, with uniquely designed, every one of our 6 guest rooms faces northwest with spectacular views of Lago Yelcho and the glacier of the Andes Mountain. If the weather is clear, the mountain looks close enough to touch. Each of our rooms is comfortably appointed with either two Queen Size beds and private bath. The lodge features a full wader room for tackle and waders, a fly tying area, and a spacious living room in front of our fireplace.We normally serve cocktails and hors d’oeuvres there each evening. Should you require assistance any time of day or night, our staff is always available. The lodge has a wooden bathtub available to relax the body after hard work day. The upper landing area above the dining room provides a quiet secluded place to utilise our fly tying area and guest computer or just indulge in a game of chess or relax with a good book, before retiring to your accommodation. 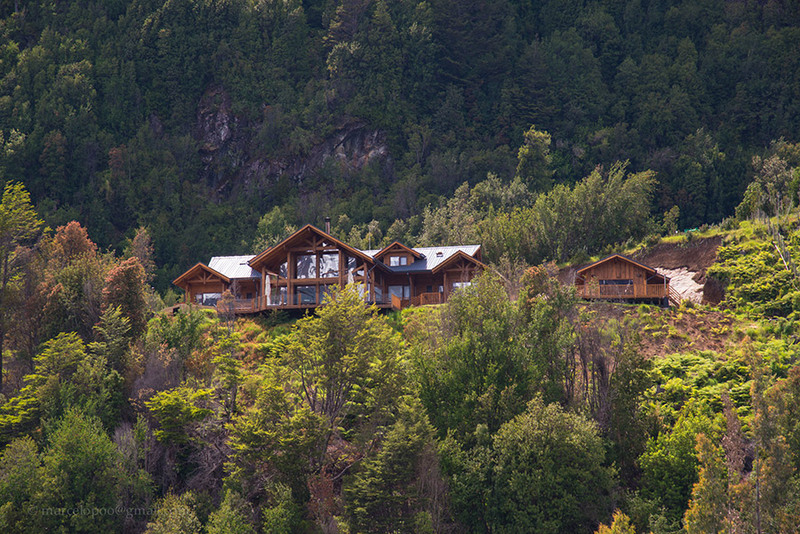 Chimalfe Patagonia Lodge takes three hard years to be open, with uniquely designed, every one of our 6 guest rooms faces northwest with spectacular views of Lago Yelcho and the glacier of the Andes Mountain. If the weather is clear, the mountain looks close enough to touch. Each of our rooms is comfortably appointed with either two Queen Size beds and private bath. The lodge features a full wader room for tackle and waders, a fly tying area, and a spacious living room in front of our fireplace.We normally serve cocktails and hors d’oeuvres there each evening. Should you require assistance any time of day or night, our staff is always available. 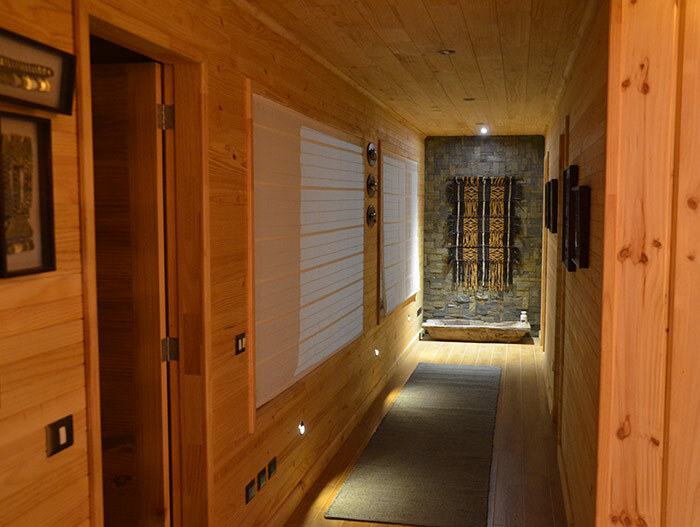 The lodge has a wooden bathtub available to relax the body after hard work day. The upper landing area above the dining room provides a quiet secluded place to utilise our fly tying area and guest computer or just indulge in a game of chess or relax with a good book, before retiring to your accommodation. Our six bedrooms are clean and comfortable, all uniquely set up to accommodate couples, singles, or double occupancy. With 6 bedrooms, we can physically accommodate 14 guest. 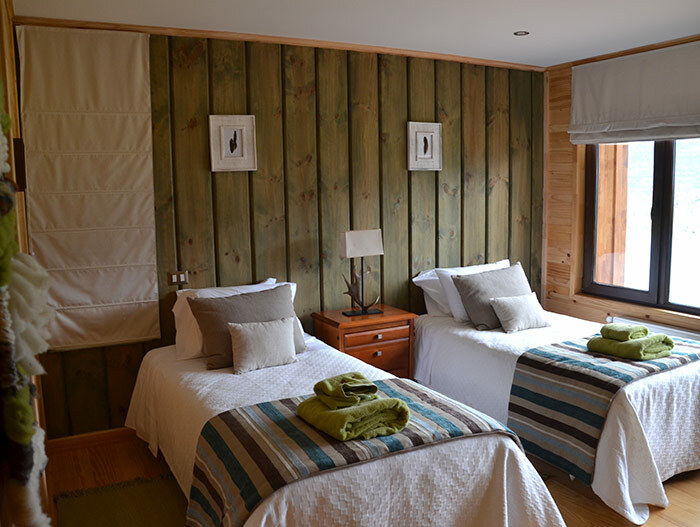 Each bedroom has their own private ensuite bathroom. 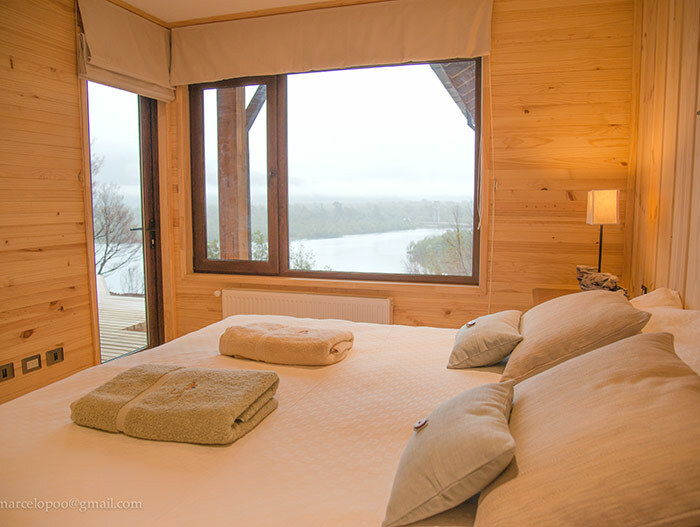 Fine linen sheets, top quality duvets, hand crafted furniture, all add to the ambiance of the spectacular wilderness setting. All rooms are equipped with luggage storage, heated towel rails, and bath robes. 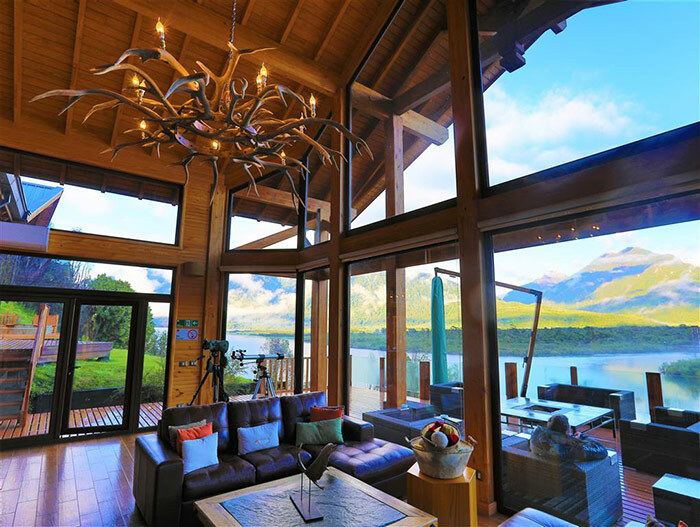 Imagine yourself relaxing in the comfortable lounge looking up the Yelcho Lake, sharing your fishing tales with other anglers and dreaming about your next day’s fishing. 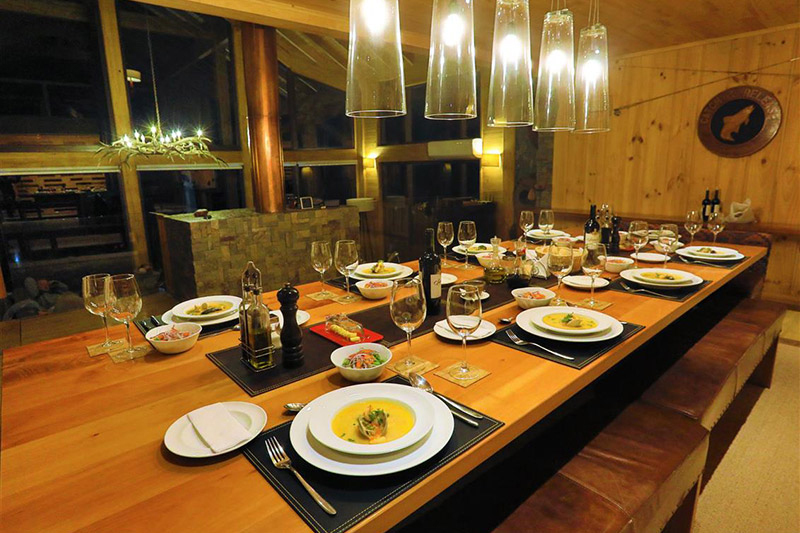 Chimalfe Patagonia prides itself on offering the best possible fine dining experience. Our Executive chef has an extensive and eclectic collection of recipes that we assure that will be a delightful for your taste. Meals are served in the main dining room and are the fitting conclusion to a day of exploring the waters of the Yelcho Lake. 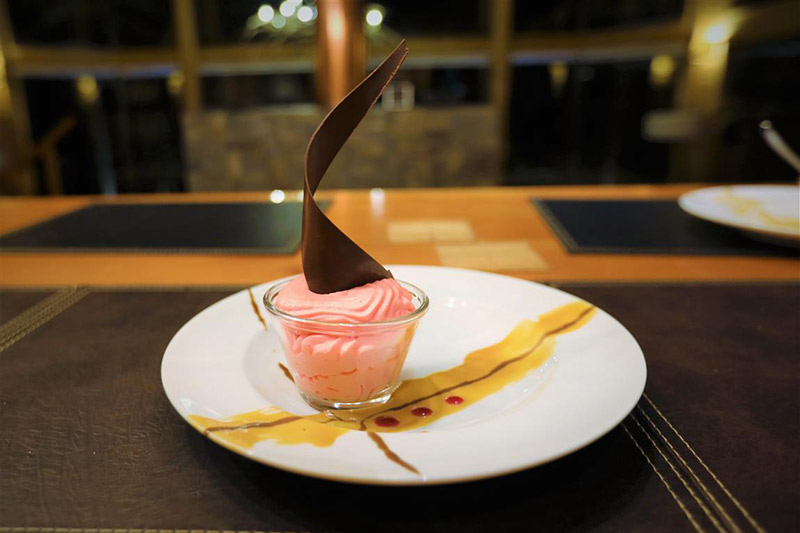 Our professionally trained chef will cook delightful cuisine that reflects an international flavor made with the freshest ingredients. 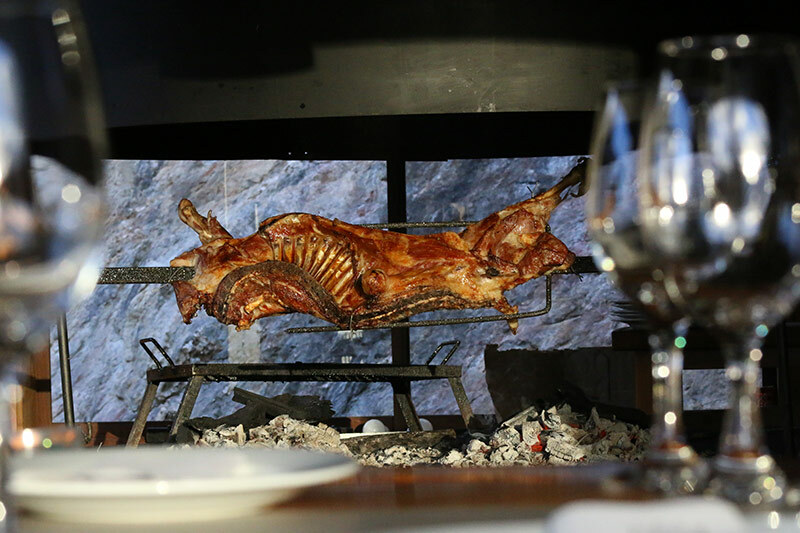 All our meals are served with complimentary Chilean wines. Should you have any special dietary needs, we are more than happy to develop a special menu for you.